This should have gone up last night, but I had ISP problems. Some of you may remember Yucatan, built in a week of evening before joining a boat for our annual trip. Well next week is said trip, so I thought it would be fun to have another go. I've been wanting to do a backdated Amos Gnollies for a while, and Shortliner's Ingleferry Sidings has inspired me. It’s 1999, and the engines on the barge have finally given up the ghost. An appeal has been launched and The Apprentice, with Bertrand’s blessing, is taking his annual holiday in the Lofotens, with the intention of helping out on a fund-raising project. He's communicating with Bertrand, who is at home in his retirement cottage, by email. The first element, including making the baseboard, is up here. Good to see you have made the start Andy, I thought it wouldnt be long going by the enthusiasm you had on saturday . Cant wait to see how the story unfolds . Okay, I cutthe cardboard sandwiches yesterday and glued everything up. Quite uneventful, actually: nothing much went wrong. You can read another email home, though, here. AndyA wrote: Quite uneventful, actually: nothing much went wrong. Not sure that is a good thing, if it doesnt go wrong, you have less to write about . I hope you are going to have a crack in the concrete somewhere for the "Ballblom" to seed itself into and grow from you need to have some on there somewhere . Yesterday I got absolutely nothing done on it except some thinking. So I have no chance of finishing it before the trip (last year I would have taken it, but we're flying up to Falkirk this time so might take the loco and driver in my hand luggage, but more probably will take the time to do hte artwork properly). That being the case, I've decided on flagstones for the dock, a try-out for the Next Big Project, so yes, Steve, I think a missing flag next to a drain, with two or three plants might make a decent vignette. I also intend making some more of the SL100 sized pallets (Sameiet Hedselo this time), to have various industrial loads modelled on them, some for the wagons and more just sitting on the dockside alongside various boxes and tea-chests. I've just cut up the track - fittingly scavenged from the original ill-fated Gnordlys - and am now plucking up courage to make the eight solder joints I need and glueing it in place before I go out. That means that if Sue is late home, I'll get some time to play trains. Okay, I got everything glued together and ran some trains last night. There is the Thursday write-up here. Having soaked a couple of figures in some brake oil that I cadged from one of the units near where I was working, and blu-tacked the gubbins for the loco together, I've decided that the driver needs some serious surgery, so said figure and the loco will go in my hand-luggage tomorrow. Simply wonderful tale, Andy, and the modeling is quite interesting too! Maybe re-inspiration!?!?!?! Kinda wish you were not going away Andy, this is a fascinating concept which I'm getting to understand more as you go along. Looking forward to seeing more about it when you get back. 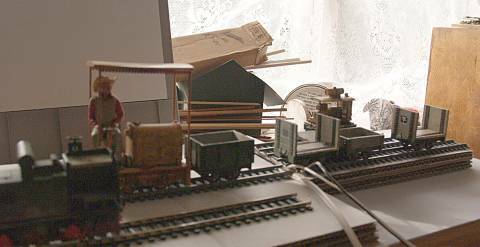 Interests: paper models, comix, cats ...oh, and railways! And my idea is: Ommit the dock and make the ship the whole layout! http://www.schichau-seebeck-shipyard.com/content/articles/000000/000079.htm?41). The RAILSHIP III has five parallel tracks per deck and uses "swivel platforms", that's what we would call a sector plate, to distribute the waggons (oh please, don't even think about the elevators!). The sector plates are situated in the bow which already is conveniently wedge shaped. The model would be three tracks wide, with two shorter side tracks and a longer middle track. Two funnels near the stern could provide an excuse why the side tracks can't have the full length. A stern ramp would provide the connection to the outer world, i.e., casset storages. An onboard switcher would be mandatory, because any problem with the landbased locos would immedeately ruin the ferrie's tight schedule. 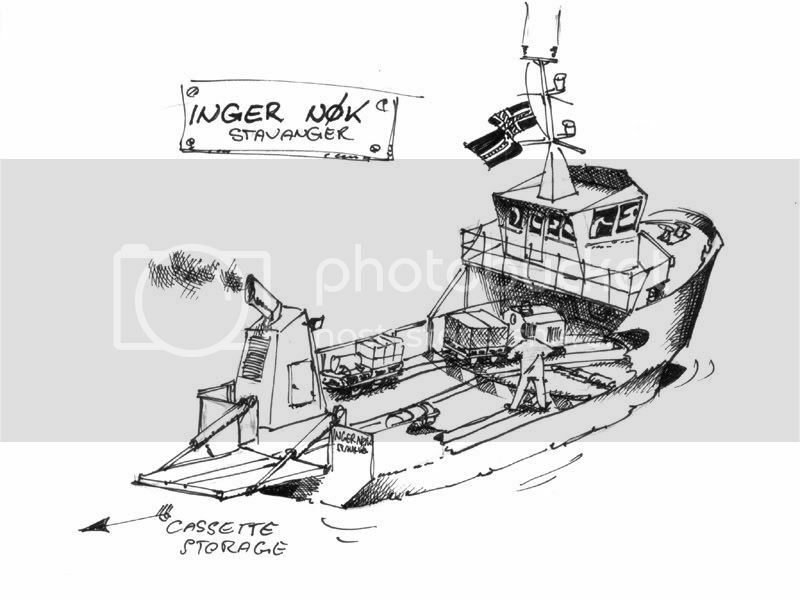 I have a ship looking somwhat like, e.g., the Sjøveg ex. Harøy (->http://www.bilauksjon.no/nma.dll/Boat?ID=34) on my mind (which would nicely corespond with Andy's background story), or maybe something more like Macduff's inter island ferry (->http://www.macduffshipdesign.com/ferries/5.htm). The latter has the advantage of having next to none shelter deck, thus providing open access and an unblocked view on the railway action. With a shelter deck covering most of the tracks you'd have to make either the deck or the hull sides removable. Well, that's it, just a weird idea, but maybe someone likes it. ...and don't drop the banana! yes, Steve, I kind of wish I had agnother couple of days, but if I wasn't going on the boat I wouldn't have started the build in the first place, so it's swings and roundabouts. Michi: both the Amos Gnollies and its ill-fated predecessor the Gnordlys were 'just the boat' layouts, so from my experience if you have a covered deck you don't just need to make the sides removable - for it to look right you also need incredibly small hands or very reliable couplers/uncouplers. The little Gnollies works quite well and even after a year the traverser doesn't look wrong. It's just that Jack's idea looked good. I'm a little frustrated at having come up with the 'inverse two from three' idea after committing to this design: I think that it would fit onto one of my 560x160 boards if I used a 90mm sector-plate/turntable on the dock, and I'll give that some thought whilst I'm steering. With the ability to 'run round' there'd also be the opportunity to use two loco's (one shoreside and one feet wet), although you're then getting to the point of one of those sliding block puzzles with only one space to move into. Yes, Andy, after a night of not beeing able to get those thoughts of small train ferries and even smaller trains out of my head, I too have come to the conclusion that a shelter deck wouldn't be such a good idea. The sector plate is partially coverd, but I shall not think that this would hold any problems, and the onboard switcher is depicted as beeing remote controlled (as I said, this is quite a modern ferry). I shall think, in 0n9, this one should fit into Carl's shoebox limits... Aaaargh, don't tempt me, gniffy demons! Love the sketch Michi and the concept aswell. Cant see any reason why it wont work, you should be able to reach everything from the open deck area. It would definately need automated couplings though, I cant see it being workable with manual link and pin types, well not easily anyway . Someone somewhere has to build that.